“Why should the devil have all the good music?” It’s a quote that has been incorrectly attributed to Martin Luther, among others. But Franco-Flemish composer Orlande de Lassus, Palestrina, and other composers in the late Renaissance actually put this idea into practice in the form of the Parody Mass. The Parody Mass borrowed from pre-existing music, often motets and secular chanson. Composers at the time commonly stole and adapted melodies the way jazz musicians do today. 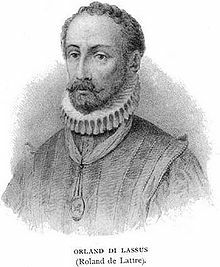 In Missa Entre vous filles (1581), Lassus based his Kyrie on a raunchy, lustful, and sexually explicit French chanson by Jacobus Clemens non Papa (c. 1510-1556?) called Entre vous filles de quinze ans (listen to the song here). Listening to Lassus’ liturgical adaptation, you would never guess the melody’s origin. Dusted off and dressed in church clothes, it becomes completely new music. Lassus was able to develop this existing seed into a profound musical statement. Notice the imitative counterpoint between voices, present from the beginning, and the rich, sensuous harmony. This gradually unfolding music is more about the moment than a far off goal. It’s interesting to consider the similarities between Lassus’ music, written over 400 years ago, and the music of contemporary composers like Ēriks Ešenvalds and Arvo Pärt.